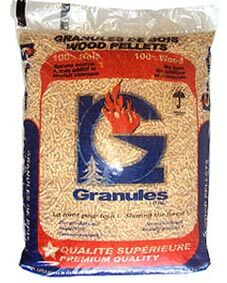 Granules LG wood pellets are known for their superior heating value and have become very popular because they consistently deliver high BTUs and low ash. They are a 100% natural product and consistently surpass industry standards for pellet fuel. They are softwood pellets manufactured from Black Spruce and Grey Pine, and are produced at a state-of-the-art pellet mill in Quebec, Canada. Note, these pellets come on 1.5 ton skids. This means that each skid (pallet) will have 75 bags for a total of 1.5 tons. Also Available in 30 Pound Bags! 30 pound bags are perfect for anyone with back issues or those who struggle with the weight of the 40 lb bag. Ships on 1-ton pallets (66 bags per ton). Additional $10 more per ton due to the extra packaging and plastic. Not available on the web site - call us to place your order.